Hikone (彦根)  is a city at the eastern edge of Lake Biwa in Shiga prefecture, central Japan. Hikone is on the Tokaido Main Line (Biwako Line in Hikone) between Osaka and Tokyo and makes an interesting stopover. Shinkaisoku rapid trains take 50 min (¥1110) from Kyoto and 80 min (¥1890) from Osaka. The Shinkansen does not stop at Hikone, but the nearest Shinkansen station Maibara is just one local train stop away. Ferries connect Hikone to the islands of Chikubu and Takeshima in Lake Biwa. Hikone Castle and Genkyu-en Garden are a 15-20 minute walk along the main road from Hikone Station. Hikone Castle (彦根城 Hikone-jō). Hikone Castle is an original castle dating back to 1604, instead of the usual 60s-era concrete reconstruction. The castle tower is an official National Treasure and a number of the turrets have been classified as Important Cultural Properties. Even the sound of the bell every three hours is preserved as a nationally important soundscape. Admission ¥500, including entry to Genkyu-en. Genkyu-en Garden (玄宮園). Hikone's number two attraction is the garden at the foot of the castle. The park contains a sprawling villa built in the Chinese Tang Dynasty style in 1677 for Naooki Ii, the fourth lord of Hikone. The best thing to do here is to pause at the teahouse for a cup of matcha (ceremonial green tea), a Japanese sweet and some quiet contemplation for ¥500. Hikone Castle Museum (彦根城博物館 ''Hikone-jō Hakubutsukan''), 1-1 Konki-cho, ☎ 074-922-6100, . Open 9AM to 5PM. An excellent museum of samurai artifacts and artwork. ¥500. Ryotan-ji, ☎ 074-922-2617. 9 AM to 4:30 PM. A zen temple with a variety of gardens, each designed by temple priests as a form of worship and meditation. The temple itself houses some interesting artwork. ¥400. Taking the JR regular [non-express] train to the next stop, along the Biwako-sen, you will stop at Minami-Hikone. Get off at this stop and there is VivaCity, a large shopping area that is the only mall in Hikone. There are many shops, some restaurants, karaoke, and a movie theatre here. On many Sundays at 1:00 and 3:00 there are live performances in the central atrium. Fans of traditional Japan will enjoy the Yume-Kyobashi Castle Road running from the southwest side of the castle park, with a number of souvenir shops and craft shops located in traditional-style wooden buildings. 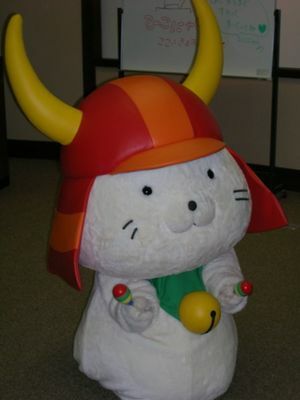 Fans of modern Japanese craziness, on the other hand, may enjoy all sorts of souvenirs plastered with the mug of Hiko-nyan, Hikone Castle's official samurai-helmeted cat mascot. Although many cities, as well as some attractions, have their own mascots, Hikonyan has gained fame well beyond his hometown, making him an iconic symbol of the samurai days and perhaps even the nation itself. Hiko-nyan paraphernalia of all sorts can be purchased on Castle Road, at Viva City, and most anywhere else in Hikone. The road from the station to the castle is lined with an array of restaurants and souvenir shops. The Yume-Kyobashi Castle Road also has a number of restaurants. Sennari-tei, . Local Omi beef specialist. Hikone is home to JCMU, the Japanese Center for Michigan Universities. If you're interested in meeting some foreigners studying Japanese, head down to Sugimotos (a small sushi shop by Hikone Castle Hotel). Every Wednesday around 9 pm it becomes a bar for students and foreigners in the Shiga area. In southern Hikone you will find Yab's Sports bar, which in recent times has become a prevalent stop for JCMU students as well. Business Hotel Serikawa (Along the Serikawa River), ☎ 074-926-2750. checkin: 3:00 PM; checkout: 10:00 AM. Both Western and Japanese-style rooms available. One person room ¥3990, two-person room ¥4830. Business Hotel Hikone, ☎ 074-924-4631, . checkin: 4:00 - 11:00 PM; checkout: 10:00 AM. Single rooms ¥5200. Hikone Castle Hotel, ☎ 074-921-2001, . checkin: 12:00 PM; checkout: 11:00 AM. Rooms start from ¥6500 (single). Hotel Sunroute Hikone, . Prices start at ¥6930 for single rooms. Tobaya Ryokan, . A very cosy family-run ryokan. 4200. This page was last edited on 30 May 2015, at 17:01.